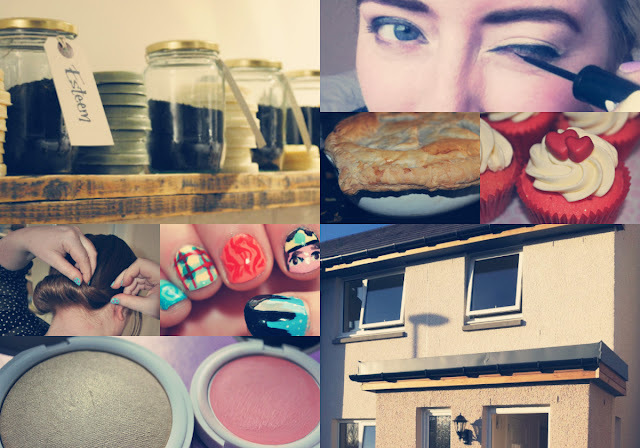 Ever So Juliet | Edinburgh lifestyle blog: Bye 2012! I can't quite believe that is 2012 over - it doesn't feel like a whole year has passed since I wrote this post! In the last year so much has happened... I learned how to cook (which was my new year's resolution); we bought a house (!!!) & I love it so much I want to hug it sometimes; we went to the olympics (awesome awesome awesome); and I had loads and loads of fun with my very brilliant friends & family (who are very brilliant indeed). It was also the year that blogging took over my life. I'm so pleased that I decided to start a blog all those months ago... it's been such a brilliant way to document my life, it's inspired me to try new things & do more DIYs & I've met so many nice people & had awesome opportunities because of it! If you are swithering over starting one yourself, I highly, highly recommend it - you won't look back! To round up my year, I thought it would be fun to look back at my most popular posts from each month. Thank you so much to each and every one of you who reads this blog... I really appreciate it so much! For Hogmanay Craig & I are going to be super lazy and stay in, but it's pretty much my perfect evening. We'll have good food, good wine, champagne & a mega pop playlist. Perfect! Have a lovely New Year whatever you do, and I'll speak to you in 2013.
oooh sounds like my kinda party! ;P looks like you had a fab 2012, here's to 2013!! Aw, ace! Hope you had fun. I've loved reading your blog over this past year. I can't wait to see what 2013 brings for you. I love this idea of having a recap of your popular posts! My fav was definitely the Brave nail art one (I wasn't a follower back then but I've been back and read it!) I also loved your Lush Spa post, made me want to go so badly!